This blog is talk about our experience at Human Rights Campaign National Conference Time To Thrive 2018 at Orlando. This was the second National conference that we have attended. We were proud and privilege to attend a conference with this type of magnitude being only 10 months business. We learned from the last national conference that shipping all our bow ties is too expensive so I drove a 19 hour journey to Orlando. I left on Wednesday night at 7 pm. I drove to Nashville until 3 am. The reason I did not stop is that I was so excited to make it to Orlando. I slept in until 9 am. Drove from Nashville to Orlando around 10 am. The drive in Tennessee was beautiful, because of all the mountains and water falls. I made it to Orlando and my journey began. I was really hungry to have actual food that was not fast food. I contacted Doctor Ron Holt @DrRonHolt to see if he would meet me to have dinner. I was able to get to know Doctor Ron Holt better. He is nationally known for giving away books, “The Many Shades of PRIDE Coloring book”. He is a public speaker and that is how he gives away the books. He is really passionate about empowering people not to be afraid of who they are as person. This was only a beginning in meeting amazing people. Roddy was also one the first people that we added to the hall fame part of the website. We just added this picture to our Hall Fame Part of the website. Roddy is a Youth Advocate for Human Rights Campaign. He is a person that has a huge heart. 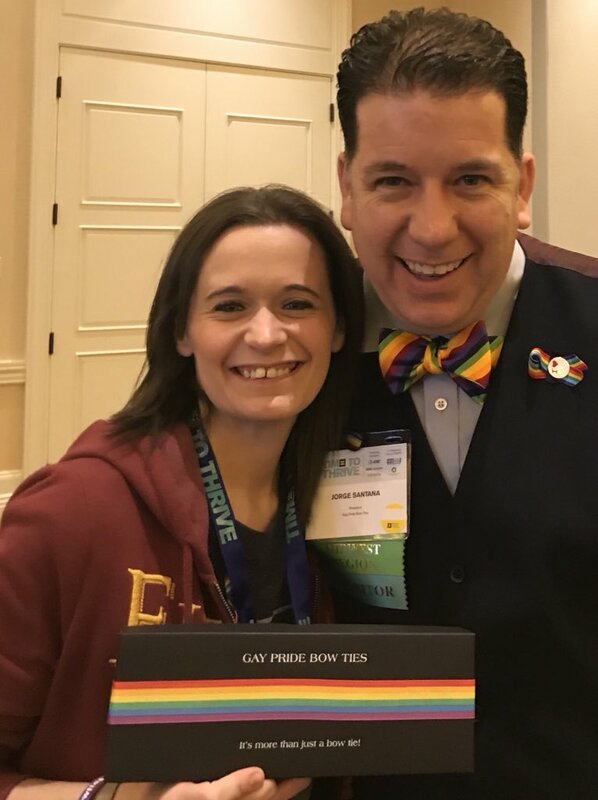 He helps create LGBTQ+C.A.R.E @LGBTQCARE with Shel Carter @shecarter17 . Shel is person I communicate a lot on twitter. She is another passionate person in this world that wants to make a difference and studying to become a psychiatrist for LGBTQ. We also added a picture of Shel partner Nikki and Shel to our Hall fame part of the website. 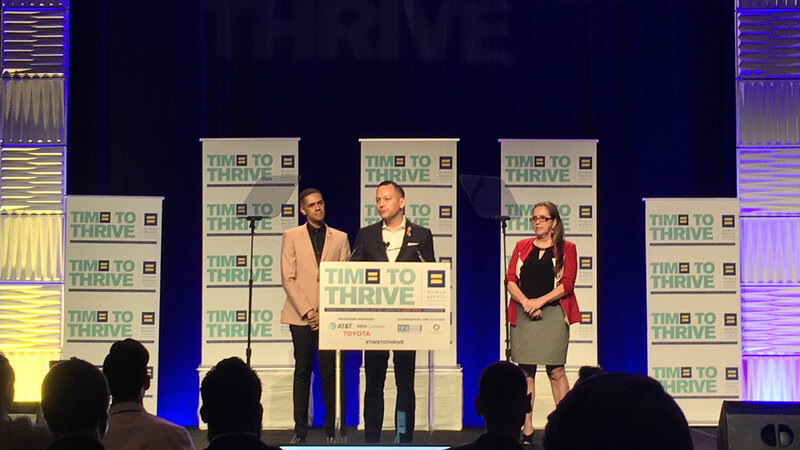 We also felt that there was no way we could go to Orlando and not invite The Orlando Ribbon Project created by Ben Johansen to our booth for @HRC #TimeToThrive. This is the story of The Orlando Ribbon Project @orlandoribbons was created after the Pulse Night Club shooting that killed 49 members of the LGBTQ family. (I also did not know that night was salsa night and most of the people killed were Hispanic). Ben’s husband was in charge of the LGBTQ center in Orlando. He created this ribbon to comfort some kids at the LGBTQ center. The ribbons became so popular; he never expected that 2 years after the massacre he would now created 515,000 that would spread love and hope all over the world. Every time there’s a shooting he has shipped ribbons to comfort people after the shooting. The ribbon has because a way to let teens know that a person is safe and supporter of LGBTQ. Going forward any National events that we attend we will invite the The Orlando Ribbon Project. It’s also a great privilage that Ben Johansen purchase a bow tie. We added this picture to the Hall Fame Part of the website. Over all we are very thank full for the Human Rights Campaign giving us opportunity to present our product to all this amazing people. We don’t do advertising so presenting our product to people from all over the country helps us get the word out about our product. We hope that next year we can attend as well. Below are more picture from customers received from HRC. We hope to get more in the future.